Ah, another day, another TYLT product! Yes, I have reviewed a lot of TYLT products before in the past, and the last one was the VU Wireless Charging Car Mount. Today, we are looking at the RIBBN Car Charger. I’m assuming that it is pronounced ribbon, because this is what it looks like. The best thing about the RIBBN is that it is guaranteed to be free from tangles. That’s pretty good because it measures at three feet, and it is available in micro USB plus Lightning. It is also available in many different colors like Blue, Red, Black, and Yellow. By the way, the part that you can plug into the car’s cigarette lighter or whatever that port is called has an additional USB port. So with this particular RIBBN, you can charge two mobile devices at the same time. So, if you want the RIBBN, you can get it on the TYLT site in the colors listed above. 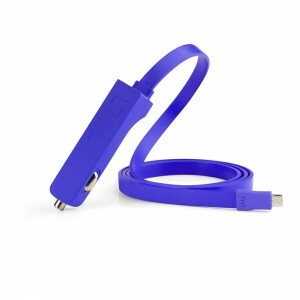 The Lightning version is available for $49.99 and the Micro USB version for $39.99.